2 1. One painting by Leonardo have fascinated veiwers for centuries. 2. 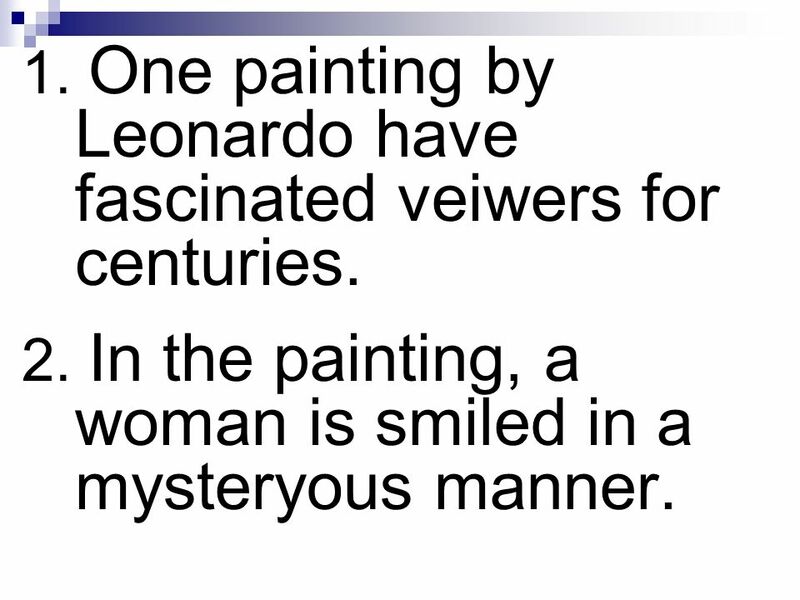 In the painting, a woman is smiled in a mysteryous manner. 3 1. 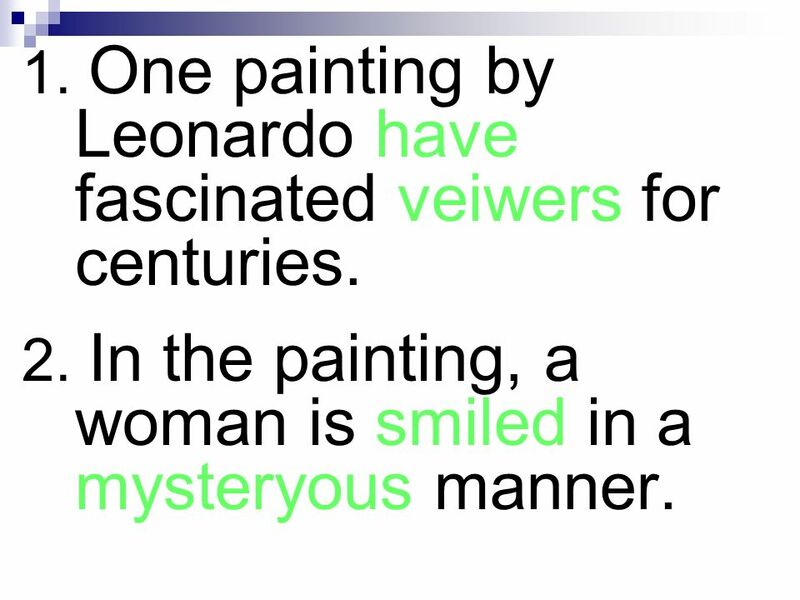 One painting by Leonardo have fascinated veiwers for centuries. 4 1. One painting by Leonardo has fascinated viewers for centuries. 2. 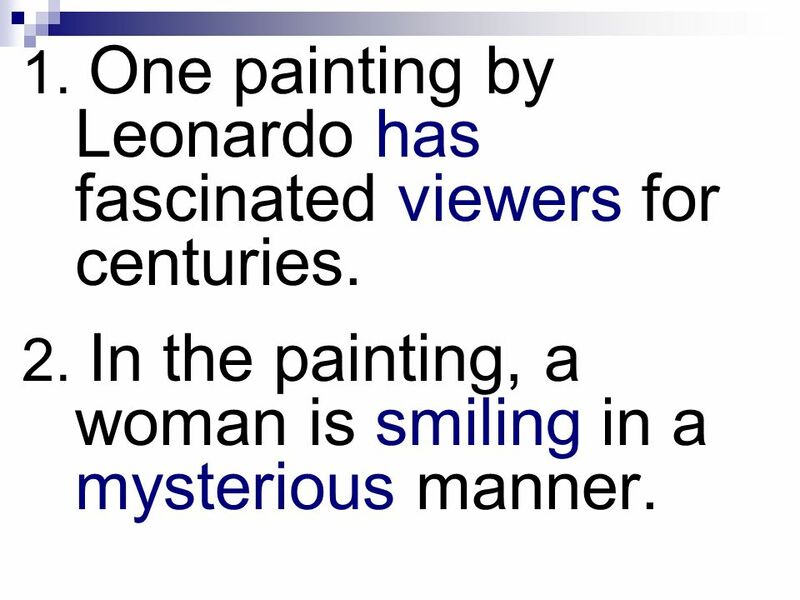 In the painting, a woman is smiling in a mysterious manner. 5 3. Leonardo romed the countrieside, sketching and making notes. 4. 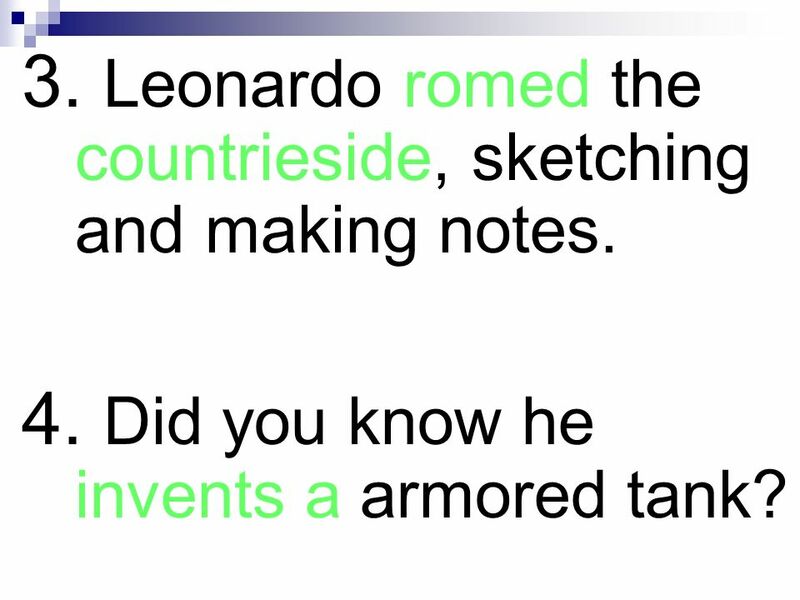 Did you know he invents a armored tank? 6 3. Leonardo romed the countrieside, sketching and making notes. 7 3. 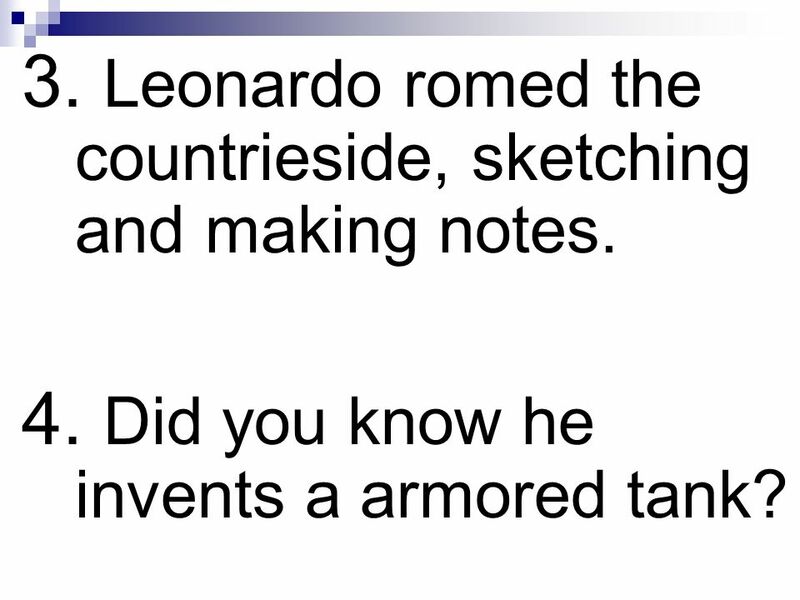 Leonardo roamed the countryside, sketching and making notes. 4. 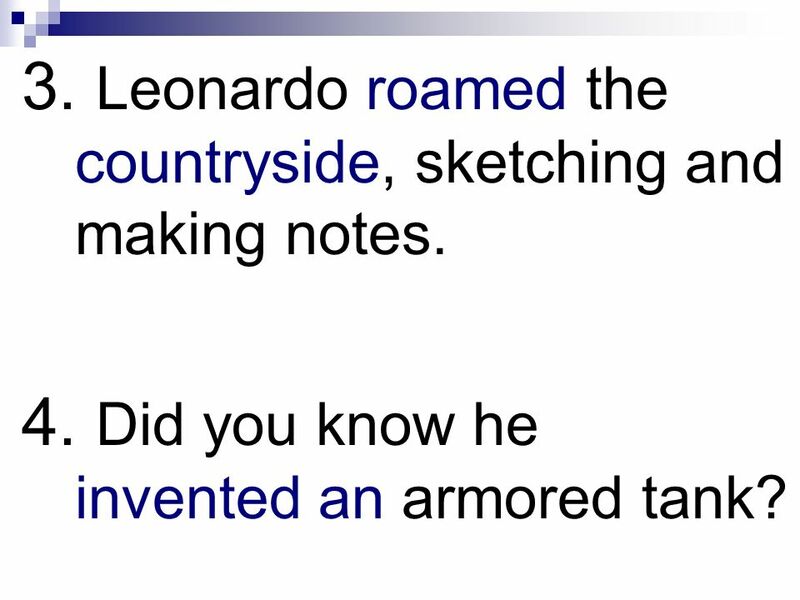 Did you know he invented an armored tank? 8 5. 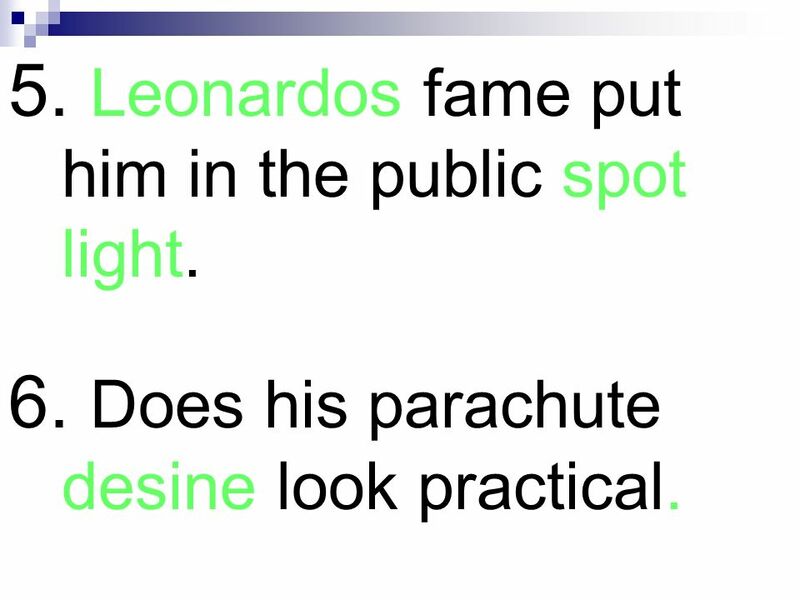 Leonardos fame put him in the public spot light. 6. Does his parachute desine look practical. 9 5. 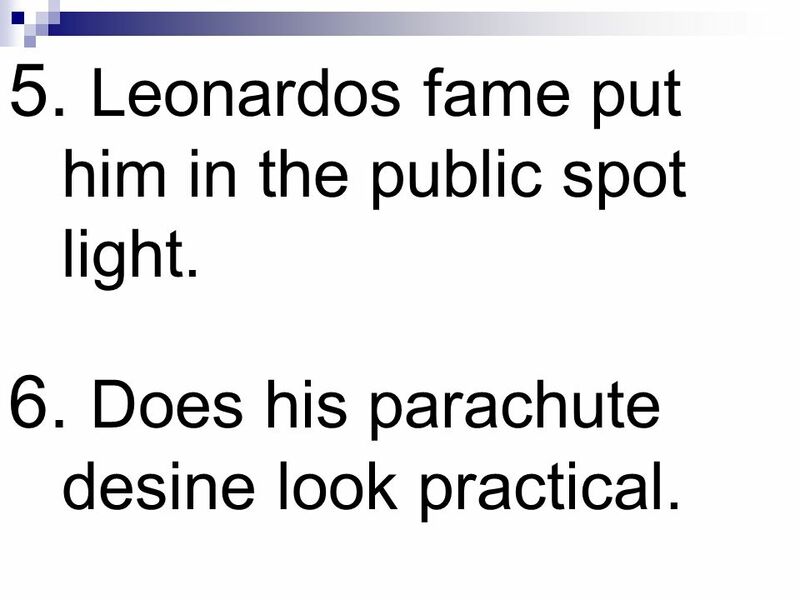 Leonardos fame put him in the public spot light. 10 5. 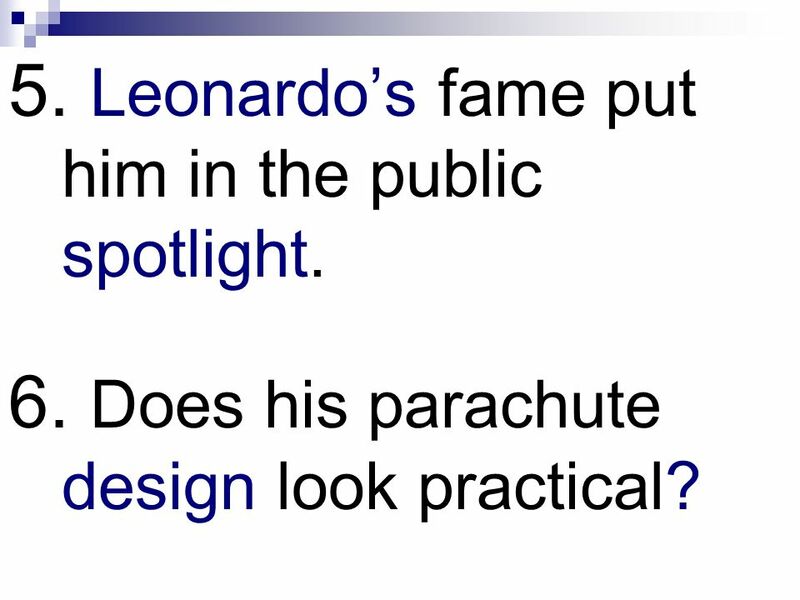 Leonardo’s fame put him in the public spotlight. 6. Does his parachute design look practical? 11 7. 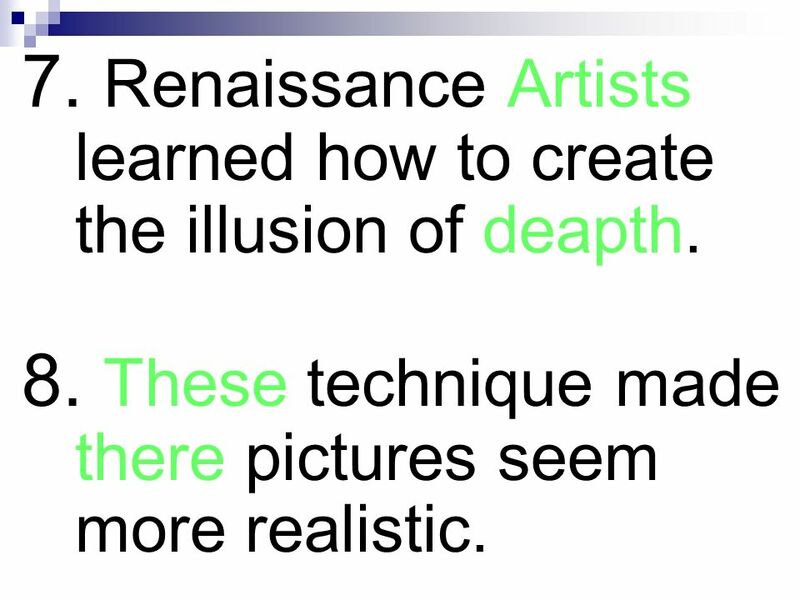 Renaissance Artists learned how to create the illusion of deapth. 8. These technique made there pictures seem more realistic. 12 7. 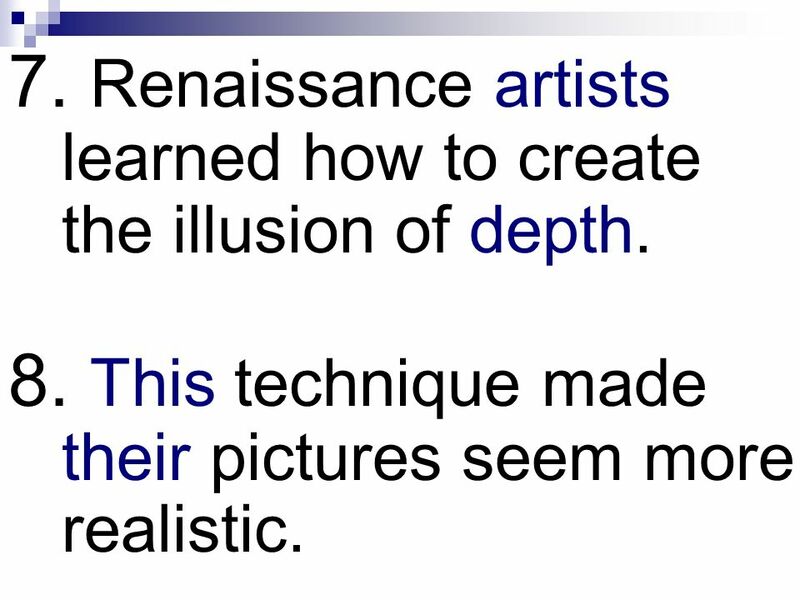 Renaissance Artists learned how to create the illusion of deapth. 13 7. 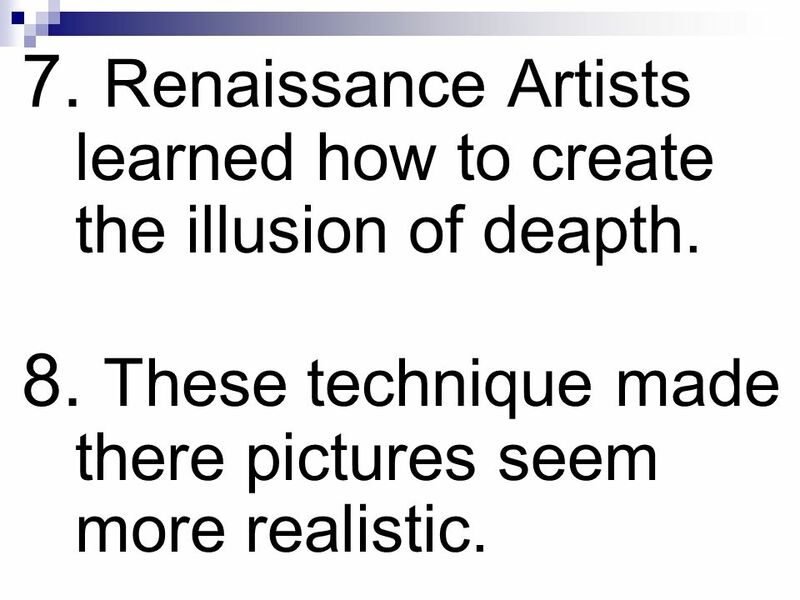 Renaissance artists learned how to create the illusion of depth. 8. This technique made their pictures seem more realistic. 14 9. 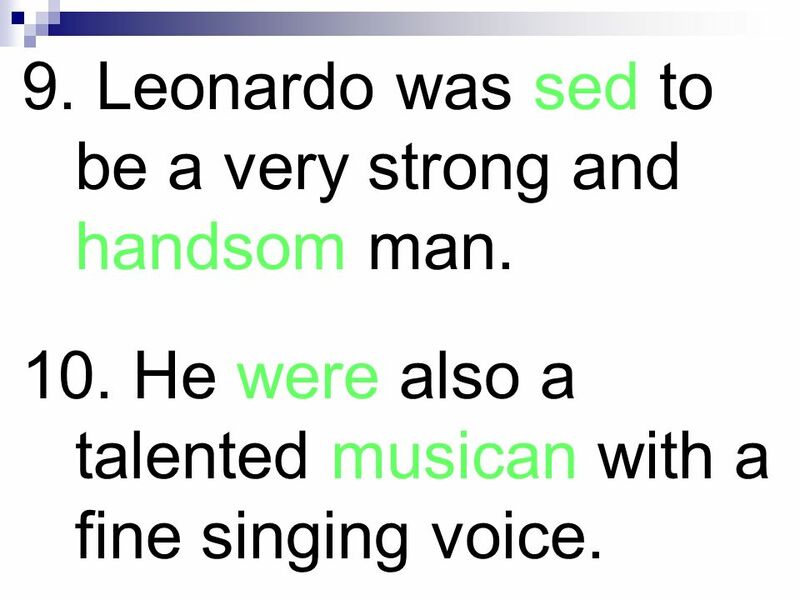 Leonardo was sed to be a very strong and handsom man. 10. He were also a talented musican with a fine singing voice. 15 9. 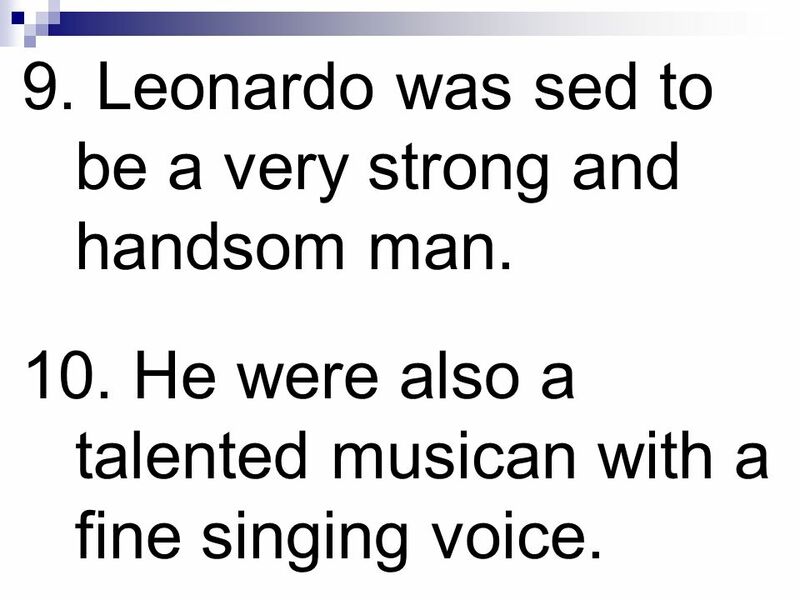 Leonardo was sed to be a very strong and handsom man. 16 9. 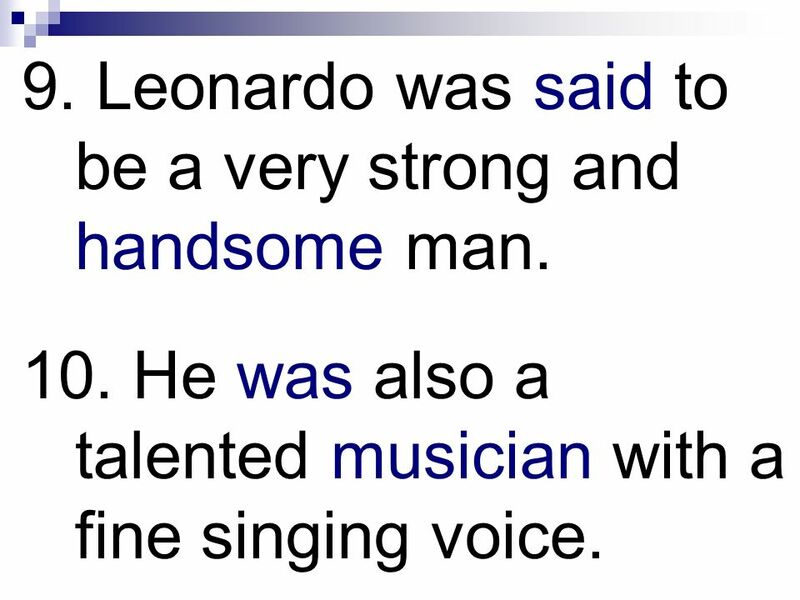 Leonardo was said to be a very strong and handsome man. 10. He was also a talented musician with a fine singing voice. 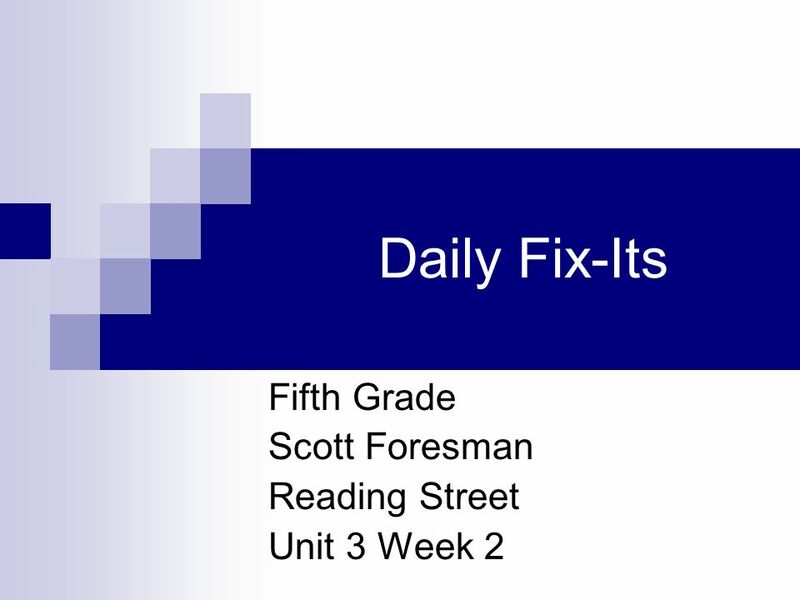 Download ppt "Fifth Grade Scott Foresman Reading Street Unit 3 Week 2"
Was Leonardo DaVinci a True Renaissance Man? Leonardo da Vinci 1452 to to 1519. The Language of Art What is ART?. What is art? Why is it important? Art is a language. Through out time, art has been one of the most effective ways to.